What adjustable rockers to buy at a reasonable cost? I need adjustable rockers, not sure what to buy? I would look for some good used Isky, Crane, Erson or Mopar ductile iron rockers. As for what you mean by "reasonable" I don't know, but you can usually get any of those three brands for around 300 give or take used, shafts and all. I was very fortunate that I have a close friend I hadn't seen in some time just drive up in the driveway one day late last year and GAVE me a pair of 906 heads, a 440 HP intake and a set of barely used Isky adjustable rockers simply because he was never going to use them. If I have any luck at all, I will. Damn. I went and looked on fleabay and evidently prices have gone up! There are some on there but like 400 or more. Even still, I'll be DAMNED if I would buy some inferior aluminum chinkesium when I could get good used AMERICAN MADE ductile iron rockers. Buy the cheapest junk you can. Never spend $600-$1,000 for stuff you can trust. 32 bucks a piece a summit. Food for thought, I bought a nice set of mopar ductile in a package deal, probably about $100 for the rockers. I'm about to send them out to Rocker Arms Unlimited (rockerarms.com) to have them bushed and their ratio adjusted to 1.6:1. They also will banana groove the shafts and check geometry for a total of $175. So hard to find 1.6:1 for less than $600, and I just don't feel I need rollers. So for under $300 it's possible to have a solid set of 1.6:1 for years to come. Damn skippy. And Gary does some beautiful work too. Mancini Racing has the best deal on rockers right now, imo, under their brand. Just over $400 & you get harland sharp bodies that are simply bushed instead of roller center. Perfect for your application. I dont have any experience with them. 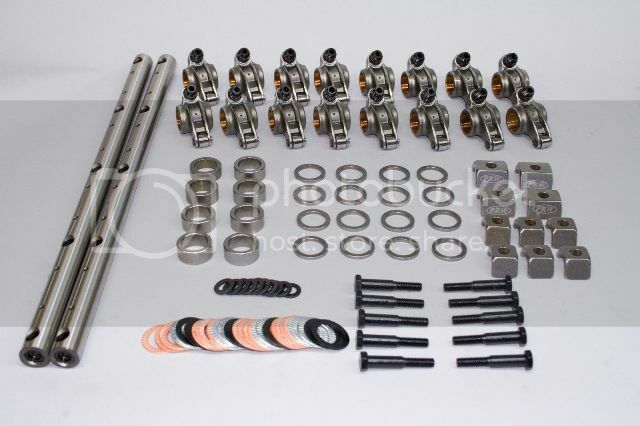 But that said, the way i look at it, there are 32 bearing assemblies between the 16 rockers, works out to about $6 per bearing, and thats if the rockers, shafts and hold downs are free. I've done a lot of skateboarding and semi-competitive cycling in my life and i would never consider $6 bearings... in a bicycle. And that doesnt even mention one of the biggest issues with them - the cheap adjusters and lands. Those pro comps may have the self aligning on either side of the roller. If they do, they are bad about unkeying the valves. That's not a good thing. I have to dis-assemble clean and correct problems with the T&D and Harland Sharp rocker assemblies I buy for $800-$1000. You cannot believe the potential problems with this type of rocker assembly. Machining chips, thread quality, adjuster lock nut mating surface, the way the adjuster cup fits into the rocker body. They take hours and hours to prepare properly, but it can be done. Sometimes you have to get additional rockers because you can't fix them all. Get them right now from Jeg's for $169.99-$205.99 depending upon the ratio. Buy them all! Save the rest of the world! Your first sentence says it all. These do not have any bearings, They are bushed. they are bad about unkeying the valves. That's not a good thing. These rockers are not "self aligning". They come supplied with good quality shim packs. Lol, sorry, had my cheap a$$ Chinese rockers mixed up, thanks for clarifying. however like to hear from someone with personal hands-on experience. I hear ya, and I know I'm still not answering your question, but I have been researching rockers myself and have come across probably 100 horror stories about cheap rockers from all makes. The thing I notice about them all is, unlike most other budget parts, Chinese stroker assemblies, procomp electronics, even distributors, there are almost NO positive reviews at all. That's the crazy thing right there. using them on some of their builds. I've heard good things about the PRW's as well, but not sure I'd compare them to those $230 rockers posted before. The PRW's are $300 more, and much of that will be presumably in machining, bearing quality and q.c. For that price, you're in Harlan Sharp and Mancini rockers territory and no longer talking about el-cheapo's.